Beautiful and dependable, Echinacea purpurea, or purple coneflower, is the crowning glory of the summer perennial garden. A member of the Aster family, all Echinacea species are native to North America. The genus Echinacea is derived from the Greek ‘echino’ meaning hedgehog, a reference to the spiny center disc flowers. Coneflowers are practical as well as gorgeous. They have long been used as an herbal remedy to stimulate the body’s natural immune system. Both plant roots and tops are used in the production of herbal medicines. 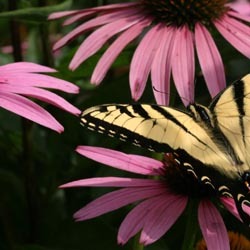 Echinacea purpurea has traditionally been used for this purpose, but research is being conducted on the nine other species to determine their usefulness for homeopathic treatments. 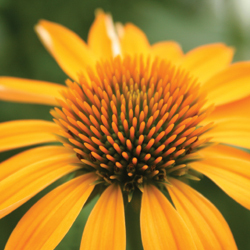 Coneflowers will thrive in a sunny location, planted in well-drained soil. They are tolerant of nutrient-poor soil, heat and humidity. 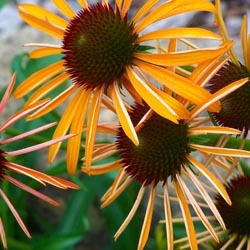 Echinacea purpurea grows on thick sturdy stems from 3-5 feet tall and generally does not require staking. Coneflowers are long-blooming, the flowers are fragrant and they make a long-lasting cut flower. This is one of the top ten perennials for attracting butterflies to the garden. You may deadhead plants after the blooms have faded to improve their appearance and to encourage a second, but smaller, bloom. You may also leave seed heads in place. In the summer and fall, they attract and provide food for goldfinches and other seed-loving birds. In the winter, the black spent flower heads add ornamental interest as they contrast dramatically with pure white snow. This perennial is not invasive, but will self-seed if flower heads are left to mature. Cut plants down to the basal foliage, the low growing rosette of leaves, in the spring. Plants should be lifted and divided about every four years or as crowns become crowded. Purple coneflower is a great addition to the back of any sunny perennial border. Its rose-purple flowers, with their coppery-orange centers, look great with ornamental grasses, Black-Eyed Susan (Rudbeckia) and Sedum ‘Autumn Joy.’ Appropriate usage ideas include: cottage, meadow, prairie, wildflower, native and herb gardens, as well as butterfly gardens and any containers that serve similar purposes. America is having a love affair with Echinacea and several new cultivars are released each year, while popular favorites continue to be top choices. The list that we have provided is not all-inclusive, nor an accurate representation of every coneflower variety we carry. Please stop by often as we continue to provide standard, new and unusual perennials, including many new types of coneflowers.